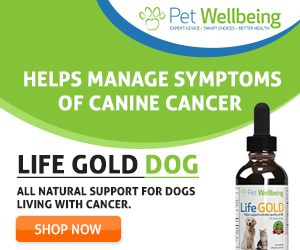 Many dogs these days are unfortunately suffering from food allergies, and dog parents are desperately looking for hypoallergenic dog treats and dog food for their fur-kids. 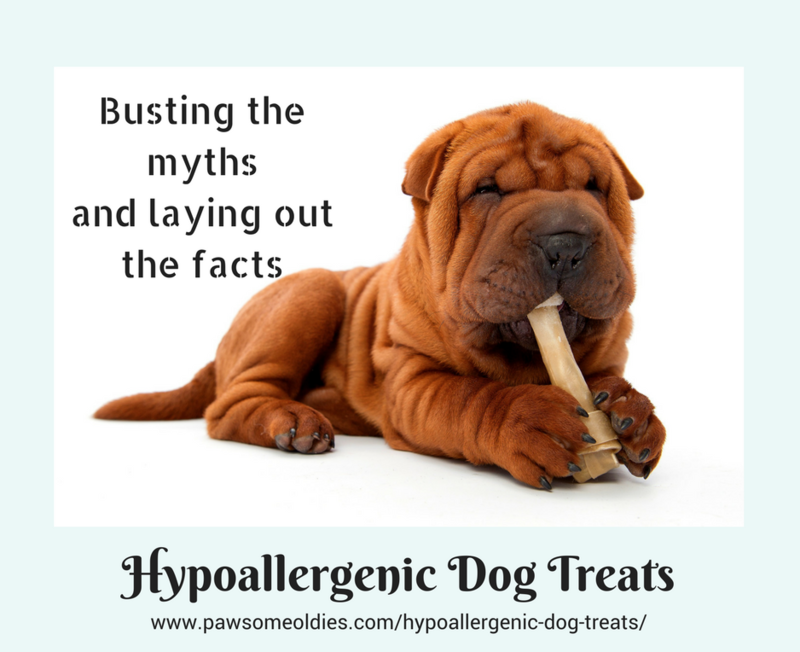 If your old dog is also unfortunately suffering from food allergies, you’ll understand how hard it is to get him some “hypoallergenic dog treats”. As I have mentioned quite a few times in my other articles, all dogs are different. They are all individual beings. Fido may be fine with a treat that contains chicken and potatoes, but the same treat may wreak havoc to Buddy’s skin and/or digestive system. You can say that one dog’s hypoallergenic treat is another dog’s poison! So… just like “hypoallergenic dog food” or “hypoallergenic dog shampoo”, “one-size-fits-all” hypoallergenic dog treats do not exist. Rather, you have to find a treat or treat recipe that is agreeable with YOUR dog. Having said that, there are some guidelines that can be used when making dog treats for those who have food allergies, and I will get to those guidelines below. 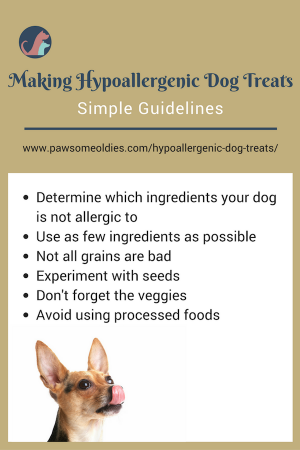 Some dog parents tend to think that if a treat (or dog food) is labeled “hypoallergenic”, then it is safe for all dogs with allergies! It is of course not true. Many recipes found on the Internet are also loosely labeled as “hypoallergenic dog treat recipes”. Some dog parents may also think that using such recipes to make treats for their dogs will be safe. Not true either! As well, some websites have recipes that are grain-free and claim that such recipes are “hypoallergenic”. Not all dogs are allergic to grains. Some dogs with food allergies are actually allergic to animal proteins. So, even if a recipe is grain-free but contains the animal protein that the particular dog is allergic to, the dog will still develop allergic symptoms if the so-called hypoallergenic treat is eaten. The bottom line? To find hypoallergenic treats that YOUR dog can tolerate, you need to find out first what protein and carbohydrate sources are fine with your dog. Hopefully, you will have already done that using the method (elimination diet) described in this article. Once you have identified hopefully a few protein and carb sources that are safe for your old dog, you can then find treats that contain only these food items. Or, use these items to make hypoallergenic dog treats for him. Yes, it seems obvious but I have seen some hypoallergenic recipes that call for all sorts of ingredients! For sensitive dogs, the more ingredients there are, the higher the chance that they will develop intolerance or allergies. So, limit the treat to one or two ingredients, preferably animal protein sources. For example, if your dog is fine with duck, then make some duck jerky, or use organ meats such as duck gizzards or hearts. If your dog is fine with turkey, make turkey jerky or meatballs as protein rich treats. You can also make simple, two-ingredient biscuits like this one. The fact that your dog has food allergies does not mean that you have to give him grain-free dog treats all the time. Granted, some common grains (e.g. wheat, corn) are known allergens and should be avoided. However, there are other grains that are less common but good and nutritious for dogs (e.g. brown rice, quinoa, oat, millet). As long as your dog does not have allergic reactions to these, they are safe to be used occasionally in your hypoallergenic dog treats. Some seeds are protein-rich and safe for dogs (e.g. chia seeds, flax seeds, sunflower seeds, pumpkin seeds). You may want to give small amounts of these seeds to your dog to see if he is allergic to them or not. If not, then you can incorporate these seeds in your dog treats. For example, by adding a tablespoon of chia seeds or flax seeds to ground turkey meat to make meatballs, you are giving your dog both animal and plant proteins (plus other goodies such as fiber, minerals and fatty acids) by using just two ingredients. Or, if your dog is allergic to eggs, try to substiute the eggs in the recipe with chia seeds (that is, if your dog is fine with chia). As a substitute for one egg, mix 1 tablespoon of ground chia meal with 3 tablespoons water. Stir and let sit until the mixture becomes gel-like. Some vegetables (and fruits) also make great treats for dogs with allergies. For example, if your dog is not allergic to sweet potatoes or bananas, try making banana chips or sweet potato chips for him. Puree pumpkin (pure 100% pumpkin) balls rolled in crushed sunflower seeds or chia seeds are easy to make and yummy to eat. An occasional baby carrot can be given to your dog to chomp on… The sky is the limit. 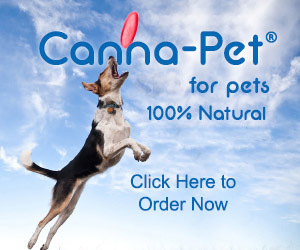 I have seen some so-called hypoallergenic dog treat recipes that use processed foods (e.g. ham, bacon). If you have bookmarked such recipes, delete them immediately! Processed foods are more likely to contain chemicals and preservatives that are not good for dogs, especially for those with food sensitivity issues. If you don’t have time to make hypoallergenic dog treats for your old dog, consider these treats. Most of them only contain one or two ingredients, and if your dog is fine with the ingredients, you are all set to go! These single-ingredient freeze-dried meat treats are made from different meat sources (e.g. chicken, turkey, bison, duck, beef, etc.). Pick the ones that are agreeable with your dog. If your old dog is fine with beef, these tripe raw nibs are great sources of protein. Again, if your oldie is not allergic to beef, these trachea chips are great – they are a good source of glucosamine! Lamb is a rather novel protein source and many dogs with food allergies are fine with lamb. These single-ingredient treats have a soft texture, so they are perfect for old dogs with not-too-strong teeth. If your old dog has poultry or beef allergies, these buffalo ears may be a good alternative for him! These treats are high in protein and are good for cleaning your oldie’s teeth because of their texture. I hope you can see by now that there are no one-size-fits-all type of hypoallergenic dog treats or recipes for all dogs. But with a bit of luck and a lot of patience, you can come up with a list of food items that are fine for use in making treats just for your dog!